To make it a real Autumn color I sponged at the brown with the metallic nailpolish 84B. Appolo. I could leave it this way, because the two colors together made it very special. But I added much more colors with the new stardust nailpolish 94. Stardust Hologram. These tiny little glitters shine in everycolor. 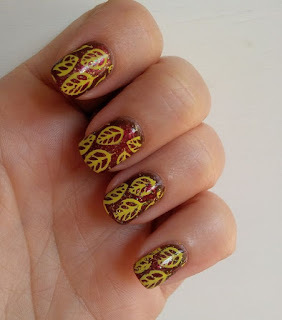 After I dried all the layers of nailpolish, I started with stamping the leaves. 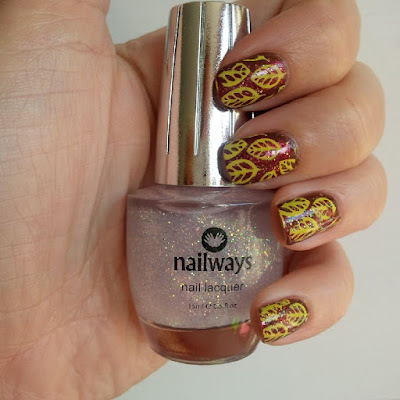 I used the large stamping plate - bontanic. This plate has very much leaves so you can choose every kind of leave you want. It's a real Autumn stamping plate. The stamping color is 26. Pastel Yellow of Mundo de Unas. After stamping I sealed everthing with top coat. Did you already made some Autumn nails this year?